We offer a single day rate for those attending Monday only or Tuesday of $375. The Tuesday single day rate does not include the Awards dinner. Both Sunday mobile workshops will be $50/person and the Tuesday mobile workshops will be $25/person. The group rate at the hotel is $145. View our full Sponsorship Benefits and Application here. Contact Eli Spang (eli.spang@narc.org) with questions. 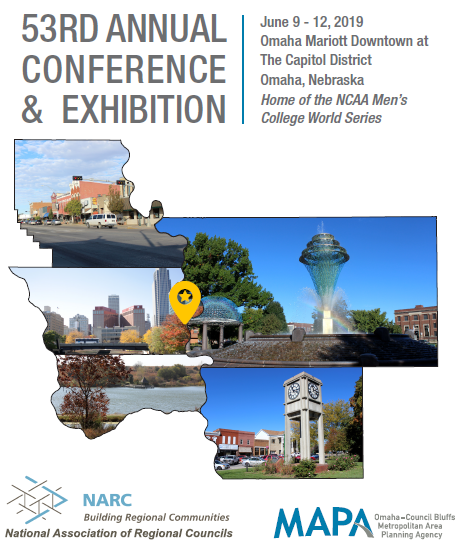 NARC’s 53rd Annual Conference & Exhibition will be hosted in Omaha Nebraska by the Metropolitan Area Planning Agency. Representatives of Councils of Government and Metropolitan Planning Organizations — leadership, professional staff, board members, local elected officials, technical and program staff — will come together in Omaha this June to share best practices, attend informative sessions, and engage in training and technical service programs.